Advanced Breathing System: Breathe naturally and comfortably through your nose and mouth. 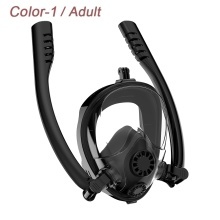 Using one-way valves and a separate breathing chamber ensures fresh air is always circulating through the mask. This combined with safe levels of CO2 make this the best full face snorkel mask. ANTI-FOGGING DESIGN: Features an advanced air circulation concept that prevents the formation of fog. Double rotatable and length-adjustable snorkels. EASY DRESSING: The silicone mask provides a snug, comfortable fit, suitable for all kinds of head shape, and is easy to adjust with wide elasticated rear straps that don’t get tangled in your hair, holds the mask in place on your head, allowing you to move freely without losing the mask.